Toast the bread and defrost the peas in hot water. Drain the pea and roughly mash in a bowl with a pinch of salt, the Meridian Smooth Almond Butter and a squeeze of lemon juice. When the bread is toasted drizzle with a little oil and give a quick rub with the garlic. 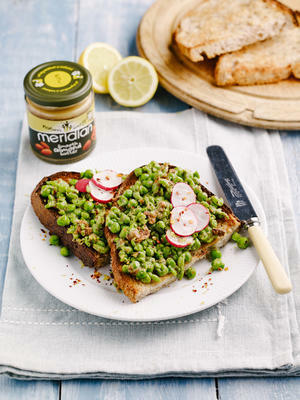 Thickly spread the pea smash on top and garnish with slices radish, a few chilli flakes and some lemon zest.